How Was This Picture Made #06? Home » Contests and Critique » How Was This Picture Made #06? UPDATE #1: The detailed answer has already been posted! UPDATE #2: Come on guys, this was an April Fool’s joke! We will always continue reviewing a variety of brands and we won’t sell out. This group photo was taken during our team retreat in Puerto Rico earlier this year. Just looking at it brings back fond memories of laying on the beach and swimming in the ocean with these amazing people. Well, at least with most of these people. John Sherman was always off somewhere photographing iguanas naked. Before we get too far into the post, you might have noticed the amazing shirts that we’re all wearing. 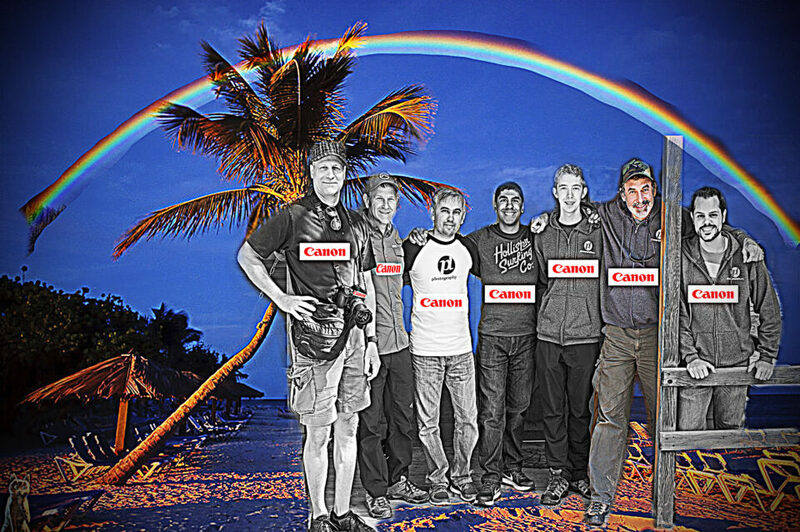 It’s time for a big announcement: Photography Life is now sponsored by Canon! That means from this point forward, we will only be reviewing Canon equipment. We feel that this is the best fit for this web site and were in no way influenced by an all-expense paid trip to Puerto Rico. Also, we have been unofficially told that Canon is heavily working on a DSLR / mirrorless hybrid, which is exactly what our team has been waiting for, so it is time to embrace the new technology. Now, back to the photo. After spending so much quality time together in such a magical place, we had to have a group photo before we left. Of course, this being Photography Life, we couldn’t just take an ordinary photo. We needed to do something special. We spent hours planning this photo. We cleaned sensors, calibrated lenses, checked weather forecasts, computed and recomputed the hyperfocal distance, figured out the spherical aberration, chromatic aberration and vignetting levels of the new Canon lens and then… we waited. For two hours. Once the wind was calm, the light was perfect and a rainbow appeared: Click! Now we don’t want you to get the wrong idea. This image isn’t so amazing because it was taken on a beautiful beach in Puerto Rico. It is amazing because when seven photographers put their heads together and try to create an amazing photo, you get an amazing photo! Also, because it was taken with a Canon camera (ahem ahem Nikon shooters!). Is there anything unusual about how this image was created? Was there anything done in post processing? What is the serial number of the tripod we used? What size of shoe does Nasim wear? Why can’t you see John’s legs? Is it any coincidence we posted this on April 1? We’ll reveal how this images was created very soon. You won’t want to miss it! I hope this is related.to today’s date – April 1! Richard, it’s April 1 already? How time flies! Sorry to hear you will be exclusively reviewing Canon. Leaves a lot of good/interesting and arguably better equipment out of the picture. Unsubscribe me. Mark, you’ll want to at least stick around long enough to read how this image was made. Be sure to check back a little later today. Just for one moment, I was shocked, then as a wave of indignation rose up……the penny dropped. Nice photo though….composition, colour balance, skin tones, sharpness….all as one would expect from a group of consummate professionals on a photo shoot…at night…on location in Hawai…of course. Betty, thanks for the kind words. Just wait until we reveal how we made it! Rick, sorry that we missed you at the team retreat this year! Hope you can come with us to the beaches of Mongolia later this year! So, now owned by cannon, bye bye all others? Oops, I will still read your posts, but sorry I am not a canon. Allan, make sure you read the 2nd part of this post once it’s up. It should give you some good news! Who ever heard of a respected photography website selling out to Canon and losing their credibility??? Oh, yeah, that one…well, life is Griddy. Next thing you know, you’ll be firing your most talented contributors…well, you always have your cash cow, Photographylife World. We have some news on the upcoming Nikon D850! Ah, easy one this. Created with a photocopier set to “stun”. Canon photocopier of course… Tripod serial number was 5537937. Nasim doesn’t wear shoes… he “models” them wherever he goes but size 14 left and 9 right since you ask, Cuban heel. John is legless, like the tripod if you read decode the serial number correctly . Post processing is from the John Noakes school of photography: scissors, glue and some sticky backed plastic. EXIF data shows the scissor were safety scissors and the glue was water based. There was a fill flash that only fired in greyscale to compensate for the over-saturated back lighting from the rainbow. Rob, that’s actually pretty darn close! Very impressive! You must have done one of these in the past. There was a guy observing us throughout the shoot and making us very uncomfortable – I am guessing it could have been you? I too am very disappointed by your Cannon deal. I will read general photography articles but all articles about Cannon will be deleted. As I am a Nikon shooter and have no interest in Cannon. It is April 2nd here, so while for some the question may be layered with meaning, the real question is not how but why. ? Martin, it is only late afternoon here in Colorado :) I hope you are keeping your eye on the upcoming Nikon D850! The picture was made with a superb Nikon camera, obviously. Oh yeah, without a doubt :) EXIF reveals it! Are these all folks that we are mourning because they were shot with Canons?? LOL :) that’s a good one! Benji, that’s why we decided to write about it! It is a true work of art. Our team will be submitting it to competitions and Spencer is already guaranteeing a spot for us at the Smithsonian! It’s April 2nd here in Russia, so I’m going to take this post totally seriously!!! Since I shoot a Canon system, it works for the best!! I can’t tell you why you can’t see John’s legs, but I do wish the same effect had been done to the guy on the far left!! Glad you noticed how much work we put into this image. Even the smallest details are important! Just a guess but…Canon will be getting some great reviews here in the future! When you said john was off photographing iguanas naked, who was naked, was it john or the iguanas? Muhammad, I’ll leave that to your imagination. I don’t understand. Is the Canon deal an April Fool’s joke? Sure hope so! It’s a mystery of unprecedented proportions. Perhaps one day, some mind, greater than yours or mine, will fathom it out. Until that day, we can only scratch our itchy bits and await divine inspiration.